Written by Billy Ray and (based on the film “El secreto de sus ojos”) Juan José Campanella. This was always going to be a hard film to impress me, as the original 2009 Argentinian thriller El secreto de sus ojos is one of my favourite films of the twenty years. A gripping, tense thriller that walked away with the Best Foreign Language award at the Oscars that year. Anyone willing to take on such a powerhouse would really have to turn the heat up. On first inspection, with the stellar cast on board, you would have thought that writer and director Billy Ray had succeeded. Not so. Not so at all. 2002 and investigators Ray Kasten and Jess Cooper are rushed to a crime scene where a girl has been raped and murdered. Ray soon realises that the girl is Jess’s daughter, causing this tight-knit investigation unit to fall apart. Years later and Ray has uncovered some dramatic evidence that may lead to the arrest of the man responsible. Once the case is reopen, some shocking truths and cover-ups start to appear and Jess, so disturbed by the events, is determined to take things into her own hands. Billy Ray’s visual eye is perfectly fine, producing a slick-looking thriller that uses light and shade to very good effects. However, the cinematography makes up for some shoddy plotting and lacklustre pacing, because no matter how you look at it, he has taken a film crackling with tension and diluted it to nothing more than something you’d more likely expect to see within an episode of any American police drama. The film lumbers around like there is no urgency. in place we get moments of quiet that doesn’t necessarily make it gripping. One of the classic scenes in the original is set in a lift, where the leads are trapped in while the man accused of the crime comes aboard and starts loading up a gun. It is one of the most nail-biting moments in recent cinema. That same scene appears here but it’s about as nerve-wrecking as, well, getting into a lift at a shopping mall and missing your floor. You feel there are times you just want to pick this film up by the collar and shake it for all its worth. After a good hour and a half, you care less and less about the outcome and so when the finale does arrive, you are neither shocked nor, for that matter, bothered. The performances from the three leads are a mixed bag too. Chiwetel Ejiofor, normally an actor who delivers great range, wanders around with three expressions on his face: shock, anger and surprise. All three seem pointless. 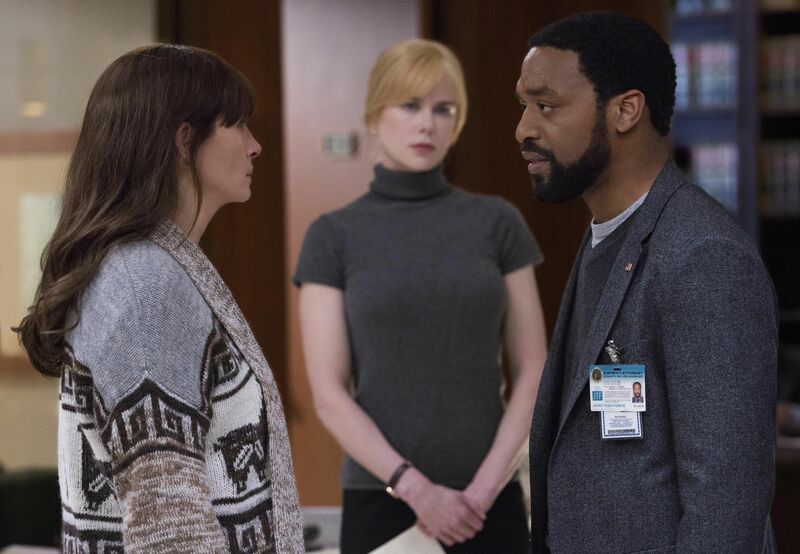 As a lawyer who once worked alongside Ejiofor’s character, Nicole Kidman has the soft focus looks but lacking in any real belief that she is a driven woman determined to seek promotion at any cost. So it is up to Julia Roberts to save the day and thankfully, she does. Her performance, as the grief-ridden Jess, is superb. Her whole face is riddled with remorse and you do genuinely feel for her. In any other movie, this would have been worthy of recognition but it gets solely lost among the lumbering and plodding of the story. A real pity, as she has never been better. If there is one good thing to come out of this, apart from Julia Roberts, is that those who do see it will want to try to track down the original. Trust me, it is well worth looking for. Those who don’t bother to see this, I still suggest you find the original and see how a thriller should be made.